1. Download the free template, print it off, cut out all of the elements and draw around each piece on complementing sheets of Simply Creative Frosted Winter paper. 2. Score and fold your Frosted Winter paper where indicated on your free template. 3. Die cut the Dovecraft Border die 8 times on a contrasting sheet of Frosted Winter paper. Glue these to the bottom of the angel, on both sides. 4. Trim off any excess paper on the edges after adhering your border die cuts. 5. Die cut 6 small snowflake designs from the Dovecraft Snowflakes Die set. Adhere three vertically on each side of the angel, with 3D foam pads. 6. Adhere the halo to the back of the head and then stick the head to the top of the angel with Dovecraft Perma Fix tape. 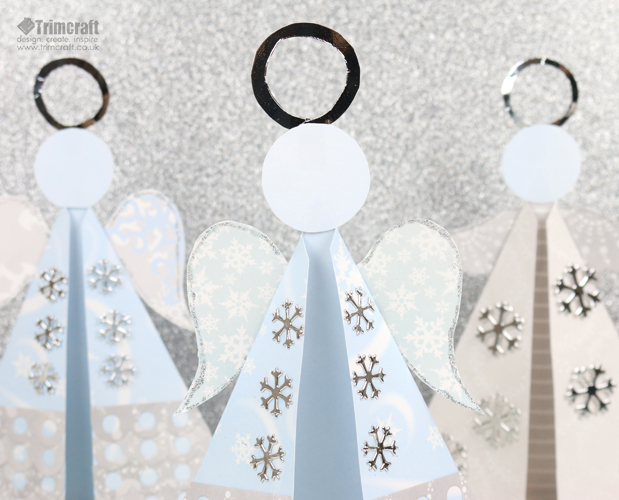 TIP: Use Dovecraft Silver Mirror card for the halo to make your angel really sparkle! 7. Using Dovecraft Perma Fix tape, adhere the wings to the back of the angel. To finish, add Dovecraft Silver Glitter Glue around the border of each wing. The Simply Creative Frosted Winter papers have a beautiful selection of delicate designs to help you create a wonderful flock of angels! What papercraft collection will you use alongside our card shape? We would love to see your versions so remember to upload them to the inspiration area and to #trimcraft when uploading to social media.